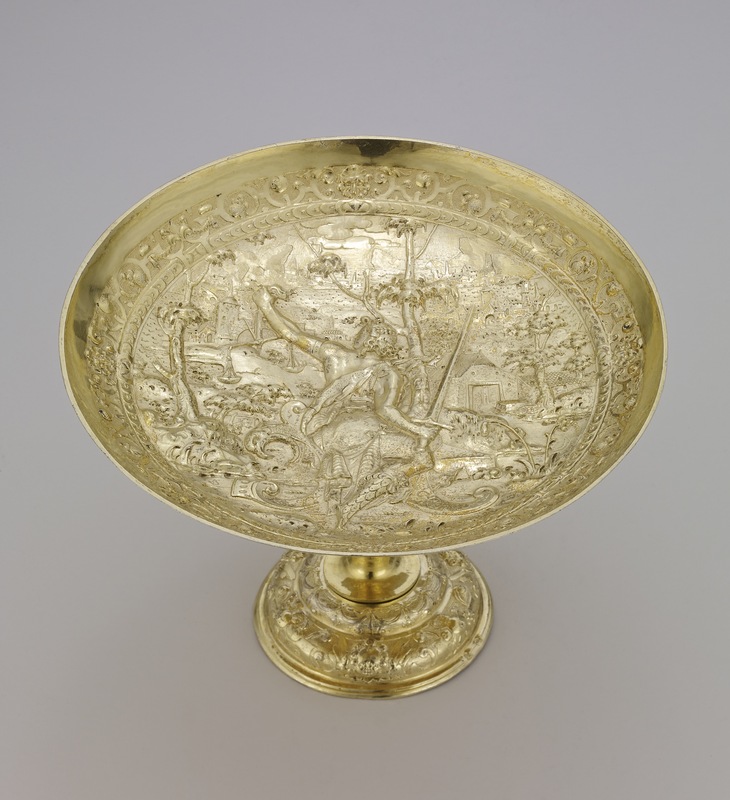 Tazza; silver-gilt; embossed and chased; Justice in landscape; border of strapwork scrolls etc; inscribed. ; knop chased in relief with festoons, lion masks, etc; inscribed. ; foot similar to border; bottom of foot with convex plate engraved with arms of Count von Thun of Bavaria; inscribed. Commentary: The Mannerist device of depicting the large emblematic figure in the centre in this curious way - turning its back on the spectator, as it were - is to be found in the woodcuts of Jost Amman, and Dr Weber has concluded that this figure-type represents a continuation of Hübner's 1594 solution (now part of the set of twelve tazze of smaller diameter in the Palazzo Pitti) and reveals the influence of the woodcuts by Jost Amman, particularly one which is now known from a second, and posthumous, publication, the ‘Kunstbüchlein’ of 1599 (Weber 1970, pp. 344-6). This woodcut, with a female figure seated on a recumbent horse, is perhaps the most similar, though the right leg is drawn up quite tightly, whereas on this Justice tazza the right leg reaches to the ground; nevertheless, in other respects the two figures are strikingly alike. In contrast, Paul Hübner's larger version of Justice in 1590, also in the Palazzo Pitti (Seling 1980, p. 254, fig. 208), provides evidence of how much less Mannerist his figure-style was at that time. The combination of the use of an exaggerated Mannerist stool and of the strong contrapposto pose of the back of the emblematic figure makes this tazza probably one of the most avant-garde pieces in Paul Hübner's oeuvre and, at the same time, one of the most finely balanced and well-constructed compositions.